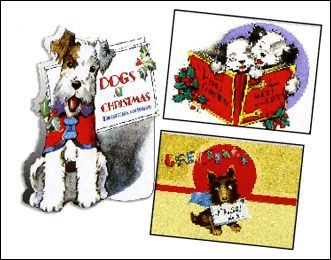 Christmas cards often picture dogs and cats; this is true of every era for over 100 years. Our pets play an important part in our lives and in our holiday celebrations. 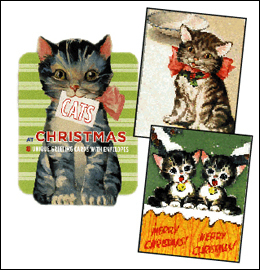 Perfect for the pet-loving sender or recipient, we offer here two sets of 8 cards (appr 4” X 5-1/2”, w/envelopes), featuring vintage dogs and cats from the 1920’s thru the 1950’s. They have simple greetings inside and come in a unique dog or cat die-cut box.